According to science, absolutely everybody in the laundromat is looking at you and judging you whenever you stop in to wash your filthy clothes. In a survey conducted of all the people nearest to the washing machine you usually use, 100 percent of bystanders watched you fumble through your overflowing bag as you attempted to cram it into the machine. The general consensus was that the bag appeared to be “too big” for the relative size of the washing machine, and several comments were made about the amount of laundry you had. Thanks to modern technology, we were able to estimate that you hadn’t washed any clothes for approximately nine days, and there was a 30 percent chance you were wearing swimsuit bottoms as underwear. 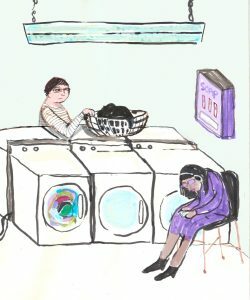 According to a study conducted by the University of California, the tiny woman who is always working at the laundromat you frequent finds you slovenly and annoying. She also recalls the two times you paid for the “Wash ‘n’ Fold” service and exactly how soiled your clothes were when you brought them in. Researchers also found that a total of 19 bobby pins, four shrivelled receipts, and $4.35 in change had been left in machines after you’d used them. Ezra Gates, Dean of Sociology at Harvard, was one of many scientists who headed the investigation into your cleaning and laundry habits. Feeling inadequate? You should. Every mother who you ever saw at the laundromat took time out of their busy, child-rearing lives to speak personally to the head researchers. Their consensus? You are too old to not know how to separate colours. “I bet they think ‘permanent press’ actually presses their clothing and removes the need for an iron,” said another. Further research is needed on whether you will ever be able to afford a place with an in-house washer and dryer unit. “You’ll definitely never have a dishwasher in this lifetime,” Gates confirmed.